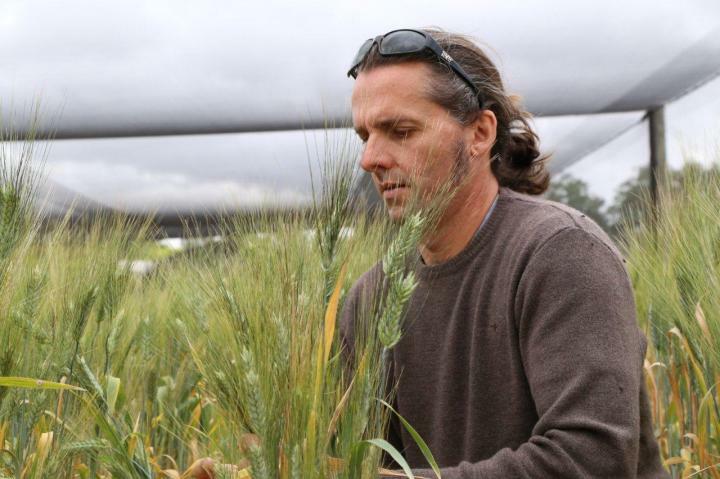 Associate Professor Jason Able with durum wheat in plant breeding trials. University of Adelaide researchers are rethinking plant breeding strategies to improve the development of new high-yielding, stress-tolerant cereal varieties. In a paper published today in the journal Trends in Plant Science, the researchers say small gene-regulating molecules found in plant cells (known as small RNA) are involved in stress adaptation, and they could be exploited to breed plants with favourable stress-tolerant traits. "Continual improvement through plant breeding underpins food security globally," says senior author Associate Professor Jason Able, Head of Agricultural Science within the University's School of Agriculture, Food and Wine at the Waite campus. "With the world's population set to reach more than nine billion by 2050, we need to intensify our efforts in breeding new cereals and other food plants with improvements in yield, quality and disease resistance. "Technologies based on gene regulation by small RNA have been known about for some time. We hope to be able to embrace that technology for a new plant breeding strategy. We call it SMARTER cereal breeding: Small RNA-Mediated Adaptation of Reproductive Targets in Epigenetic Regulation. "It's a fancy acronym which basically means using these small molecules during plant development to control characteristics such as reproductive timing." Improving yield potential and stability under different growing conditions is a major focus in plant breeding research at the Waite campus. Crop production, particularly across Australia, can suffer significant yield losses due to environmental stresses including drought and heat. "We can use these newly developed technologies to alter gene expression in a controllable and precise manner, to enhance stress tolerance and alter reproductive processes, such as the timing of flowering to avoid environmental stresses," says Associate Professor Able. "These SMARTER cereal breeding strategies could be one of the most promising solutions to improving agricultural productivity, by developing varieties with superior agriculturally and economically desirable traits and, most importantly, improved grain yield for growers." Page took 0.025136 seconds to load.